In presence of Governor Punjab Ch Muhammad Sarwar, the president gave assurances the PTI government was neither going to amend the blasphemy law nor recognise Israel. Pakistan’s president has said the government will not amend the blasphemy law. 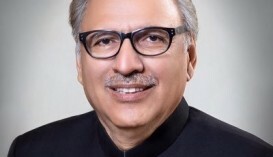 President Dr Arif Alvi also said the government has no plan to recognise Israel. He made the remarks during an address at Governor’s House, Lahore, on November 17. Dr Alvi emphasised the need to highlight the true essence of Islam. But he said he will consult ulemas to seek their help to see what role they can play to ensure blasphemy laws are not misused. He said they should fully cooperate with the government to ensure the laws are not used to create chaos under the guise of religion.